5.primer filler-"high build primer" some of the best spray can primer i have use!fills in deep scratches pretty good. 6.also look for "ez spray tops when using sray paint,they are sooooooooooooo much more comfortable to spray than your standard top. 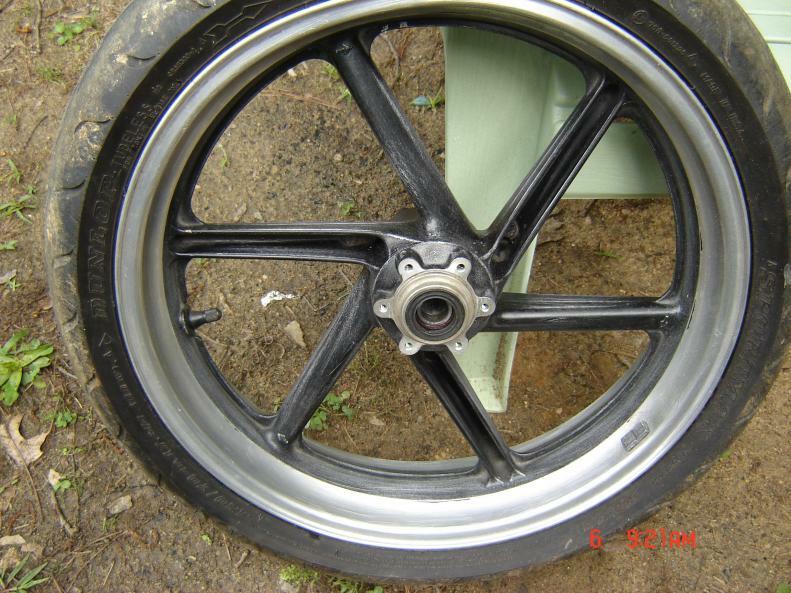 7.the front wheel primed on one side. (i did not tape up because the bearings and tire are being replace,if not being replace please tape up.it will save you some time and clean up will be simple). 8.primer came out ok(im painting outside in normal wind and dust)take note of my good shop helpers, bucket and seed eater.they never ask for much!the screw holes also could be filled with old srews to prevent paint and dust from getting in here also. (i just use paint thinner on my screws and it comes right out)! 9.close up of the outside inside corner of the "blades".this is a common problem from lack of cleaning the rim right,dust flying when paint,bugs,just plain ole' stuff in the air!when primer dries its ok to use a cotton swab to remove this(works fine for me,use whatever your comfortable with). 10.Heard a noise in the background,had time to set the timer button on the camera before she tipped over and broke the hell up!lol,i would use jack stands if you have them to keep stable while you have the front on stands.i just lifted the bike on the jack stand in front,and use the jack to lift the bike,and put jack stands under each rider peg left and right side!dont worry about my bike color,its not staying.just trying out different stuff for looks. 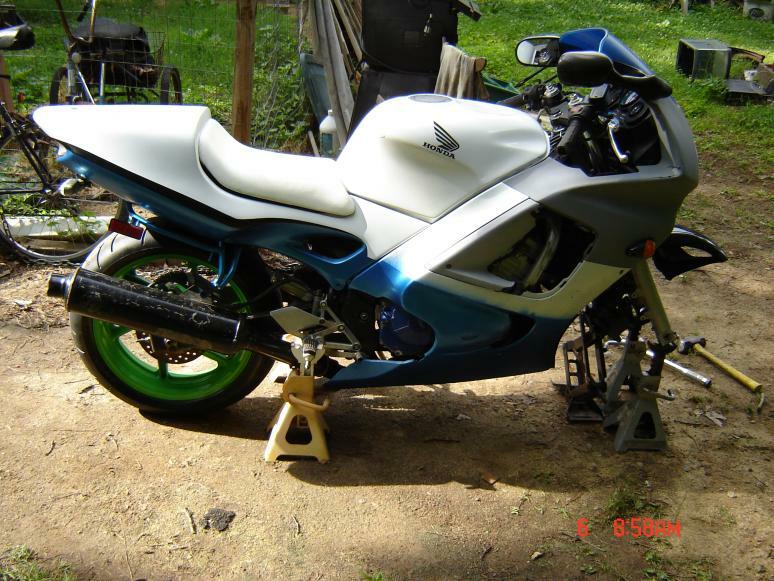 11.grabber green(dont flame me about the color this was all i had,i know its a kawa color. (Just showing how i like to paint stuff so others can do it with not much time and anywhere they can).love the dupli-color paints,ez spray tips are the best!i pick the 500 degree because your painting rims and i know your going to have rocks,trees branches,bugs,whatever hitting them and inthe past the stuff i painted i use regular paint,and it's SO MUCH THINNER than this stuff. (use whatever you want,for rims 500,1000,1500 even may be to thick for some people).you can use even truck bed coating for the guys who like the black/red look! 12.next i sprayed the GREEN on not covering the wheel with alot of paint just a lite coat needed for the first coat(looks like a heavy coat but thats because i'm using 500 degree paint so it comes out kind of thick,not as thick as 1500 or truck bed stuff,but you get the idea).again i did not tape up cause i (think i do pretty good with out taping but,lol )didnt care for the tires. 13.seed eater and bucket doing a fine fine job as always!!!!lol. 14.different shot of the first side of the rim 15.first side complete with primer and paint(no clear added yet).still looks good(to me atleast). 16.another shot of the rim(still was thinking about wet sanding but i'm not keeping the color, but a whole nother write up!!!). 17.just showing how i had the bike jacked up.for those who work on the own bikes pretty common. (besides the jack). 18.rim is finish! (with paint no clear yet),showing the dust mask very important when painting! (Most people dont use when painting). .
19.another shot of the rim.notice the overspray on the tire(when you tape up the rim,or take off the tire this does not happen.... had to put that....duh). 20.the clear coat"valspar" brand spray paint.got from lowes(didnt have the money to get dupli color clear,but got 2 cans of this for the price of one can of duplicolor clear.NO EZ SPRAY TIP,SO hard to spray this line of paint,feels like the tip would shoot of the can,(thats how hard i hard to press the tip to get the paint out!it did what its supose to do,good paint,but hard as hell to spray!i would not buy this brand again. (thats just me). 21.a shot with the clear on one side. 22.close up of the paint!should wet sand but not keeping the color.looks o.k(could be 100% better).can still see the dirt and other stuff on the face of the rim(were rotor bolts go,paint thinner takes this right off,if you tape this up you wont have to worry about this). 23.another close up! 24.got the blade clean(cotton swab or dremel you make the choice).came out ok. 25.another shot of the rim.2 coats of primer,2 coats of colour and one coat of clear.thats how i paint.for others use what works for you!!! 26.final shot of rim. 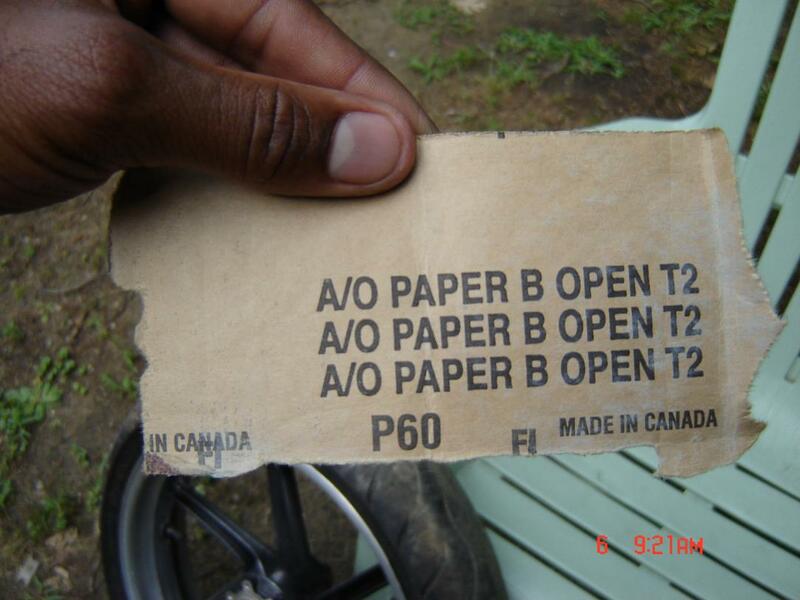 (to lazy to tape up...just paint the tire black to cover up lol.) 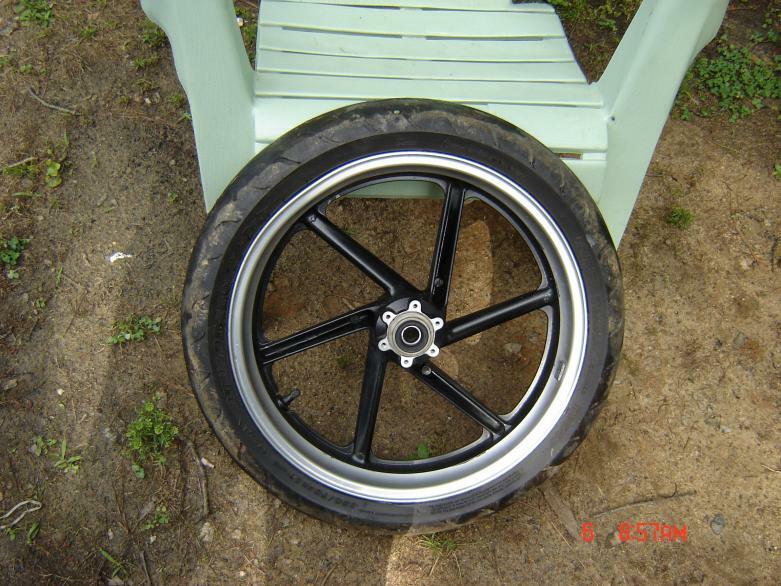 dont suggest painting the tire if you plan on riding on it,just to be safe. 27.got a little of the black paint on the rim,but paint thinner takes right of without messing up the paint.the color to me is terrible, to me i would of like to find some neon yellow for the rims,and do the body the stock f3 blue,whit and neoen yellow colours.i think the f3 have the BEST by far stock color available to date then any other bike out. hope this write up helps all who needs it.if you have any questions pm me! thanks and ride smart,ride safe!! 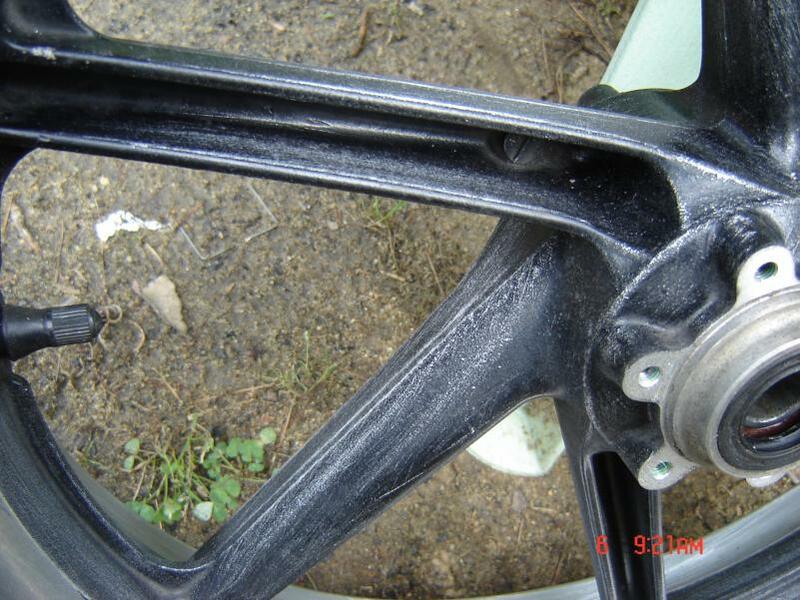 22.close up of the paint!should wet sand but not keeping the color.looks o.k(could be 100% better).can still see the dirt and other stuff on the face of the rim(were rotor bolts go,paint thinner takes this right off,if you tape this up you wont have to worry about this). 24.got the blade clean(cotton swab or dremel you make the choice).came out ok.
25.another shot of the rim.2 coats of primer,2 coats of colour and one coat of clear.thats how i paint.for others use what works for you!!! 27.got a little of the black paint on the rim,but paint thinner takes right of without messing up the paint.the color to me is terrible to me i would of like to find some neon yellow for the rims,and do the body the stock f3 blue,whit and neoen yellow colours.i think the f3 have the BEST by far stock color available to date then any other bike out. 28.working on the body after i got done with the wheels.just wanted to get the body done but been painting it off for so long.you get a look of what they look like on the bike.my bike is rough but if you look at my picture album it came along way.painting the stock exhaust over again also(using high temp paint too(1500). 29.working on the solo tail.everything on the bike is smooth just looks rough! First, the second post is under me but I merely edited due to large picture count. The entire write up and pictures were submitted by edwardzx7 and he should get credit for it in its entirety. Second, if you love your bike please use a couple bike specific stands. Rear and front stands can be found for $100 - $150 if you dig. Great investment for maintenance and keeps the bike shiny side up. Again, nice write up and pics! Thanks for the submission! The pics don't appear to be showing in the post you added, chain. Try it now. They are showing up for me. Not sure why they aren't showing up for you. lots of red x where pics should be. some show most dont. same here just getting the red cross thing on last half of first post and all of second post.. very detailed write up though many thanks. found out how to post pics!!!! thanks for the help chain!pics work now! I got my front and rear stand from harbor frieght for 40$ a peice and they are excellent. Looking good for a rattle can job! Just remember PREP is king with any painting/coating! 90% of your time should be doing prep work as this will make or break the job. I would also suggest that you remove the bearings and do some masking on the hub areas though as it just makes for a better quality job. If you don't mask those areas... when you remove your brake rotors and sprocket it can cause the paint to stick to them and peel/flake. I hang the wheels by the valve stem hole so there are no hook marks the be found but some people use a chain around the center of the wheel which works great also. 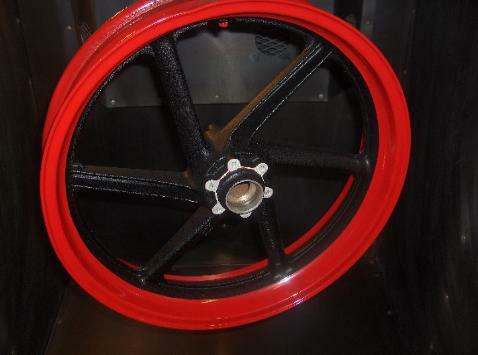 I have attached a image of a CBR F3 wheel I coated to show everyone where I mask them at.